Located right in Medan's business and shopping district, the hotel is conveniently accessible for leisure and business. Approximately 39 km from the hotel, a 60 minutes drive away from Kuala Namu International Airport and walking distance from Train Station (Railink - Airport-to-City train). Unrivaled spacious rooms for everyone, equipped with complimentary WiFi and contemporary furnishing, luxurious bedding and flat-panel TV. Our Grand Ballroom can accommodate up to 1200 person. Being in Medan's Business and Shopping districts, Grand Mercure Medan Angkasa is located a one hour car ride from Kuala Namu International Airport and within walking distance to the Train Station (Railink - Airport-to-City Center Express Train) . 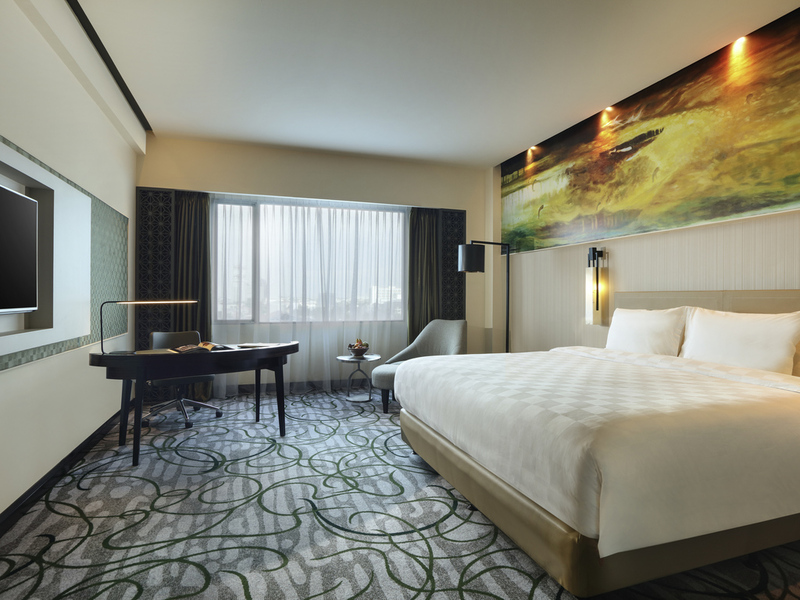 Grand Mercure Medan Angkasa hotel is the perfect place to stay and explore the city, whether to visit historical sites or enjoy its unique cultural diversity. The hotel has the biggest Presidential Suite in Medan with 320,57 square meter room space. A franchised restaurant from Singapore serving dim sum, barbeque and ala carte chinese food with 6 VIP rooms. A contemporary designed restaurant with a comfortable and nice ambience for your daily dining. We serve an international buffet breakfast and a variety of western and local delicacies that will cater to most discerning tastes. Generally, the hotel is ok. Exterior looks great, however, interior is low standard. Except for the reception floor, the rest is very old. This especially to the fitness area including the swimming pool. The gym equipment is very old. I usually stay in here when visiting Medan. But last visit is a little but unsatisfied due to some matters. At first when i checked in. I was ordering King size bedroom in no smoking floor, but due to no availability of the room, i was given choices between King size bedroom in smoking floor or twin size bedroom in no smoking floor. Then, in 2 days in a row i'm going out early in the morning and have already put the &quot;make-up room&quot; sign, but my room still messy when i back in the afternoon. And i had to call repeatedly to tell them to do so & i had to wait again before i can take rest. I had to ask new towel everytime after they make-up the room. Coz they didnt put it there automatically. But thats a minor complaint. Overall i like the hotel ambience & the staff quite friendly. The location is great also. Great bedroom with a good choice of breakfast. However the Camomile Meeting room is rather smelly. The bedroom is spacey and very comfortable. Although the TV Channels are limited and it was rather a bit blurry (I was staying in room 816 for a whole week). The breakfast is okay somehow. The point that I would say rather disappointing was the Camomile Meeting Room. We were having a 3 days meeting in the same room yet the room itself is: 1. Smelly (smells like a wet and soggy carpet) and 2. Lack of lighting. Funny side of the story as well, it was Earth Hour on March 30. The banner was there to save the power of the electricity while at the same time the hotel management decided to put a- at least 2000 watt sound system speaker and lights. I'm not sure whether the hotel is actually support Earth Hour in a right way or consistently doing the sustainable development principle at this point. I booked for 4 night and all meet my expectation. My room was upgraded to premier room since I'm Le Club Accor Hotels Gold Member. Check-in and check-out was quick and easy. My last stay from march 25th-29th was the bad experience after many times i was stay there. My le club point didn't credited directly , and the another more problem. We requested for a non smoking room but have to put up 2 nights in room on smoking floor(room 904 on 9th floor). Bathroom was bit old & hot water never felt hot at all. Some what dissapointed. Despite the room was dimly lit and has no toilet spray/bidet in the ensuite, the room was spacious and clean. The breakfast was great too. The staffs were friendly and accomodating. I love your hotel, and will back again soon. Service exellent to guest, to my room very nice. Take a bath very comfortable to service and my room over there. Responsive, accommodating, 5 star reputation preceded and satisfying experience. A pleasant stay in your hotel (again). The experience at check-in was normal, but I was confused, said receptionis, my credit card was open, but it turned out that when I checkout early, the credit card has been settled. So I have to wait 14 working days to get credit back to my credit card. My advice, don't settle first, it's better to open it. The atmosphere of the room is good, it's just that the equipment in the bathroom has a lot of damage and there is no jetwasher in the toilet. The rest of the breakfast is super, the variety of food is sufficient and it tastes very good.